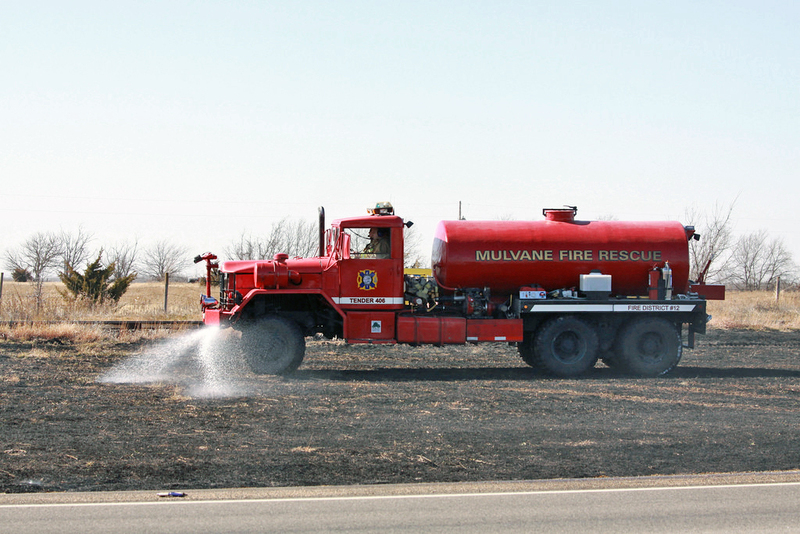 This truck was retired by Mulvane in April of 2018 and transfered to Cowley County FD #4. 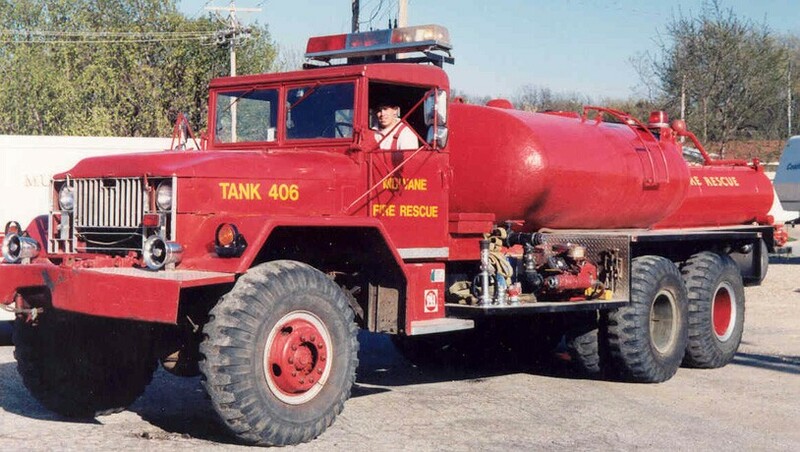 It become Udall Pumper 42. 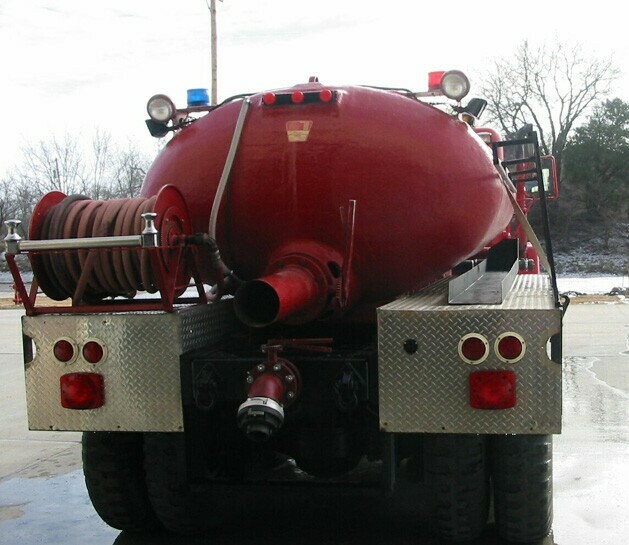 New Brush Pumper/Tender 406 replaced this unit February 2018. 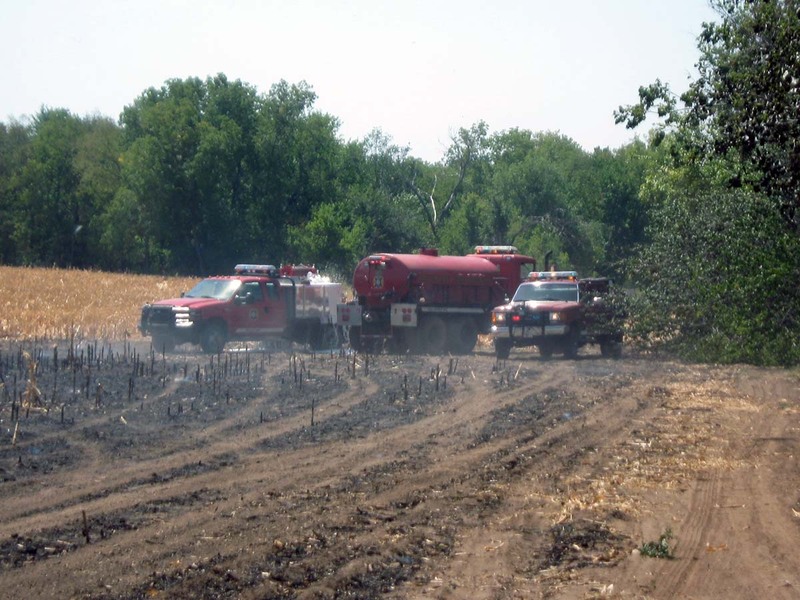 July 2011, Mulvane Fire Rescue is awarded a VFA Grant from Kansas State Forestry Service for $1,938. 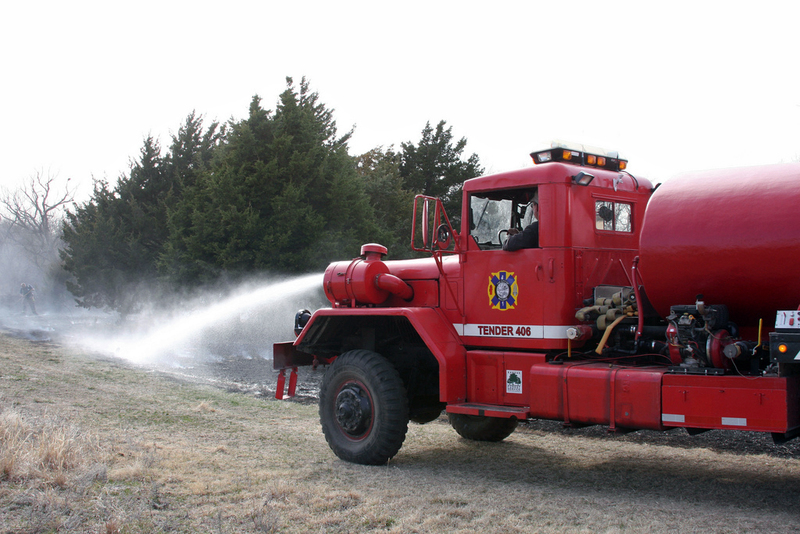 Kansas Forestry Service provided $1,938 to purchase a new Hale Foamlogix 2.1 Foam System for Tender 406. 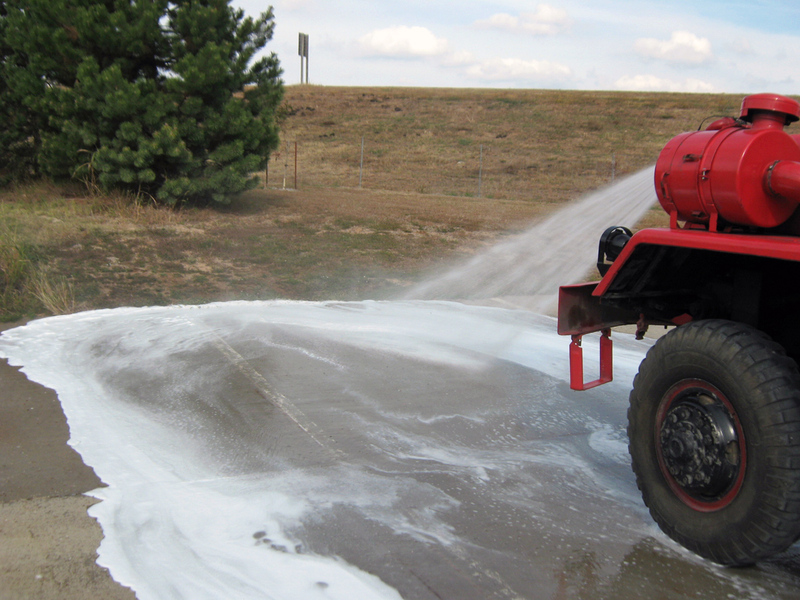 The project included a 12 gallon Foam Tank, front bumper ground nozzle and installation. 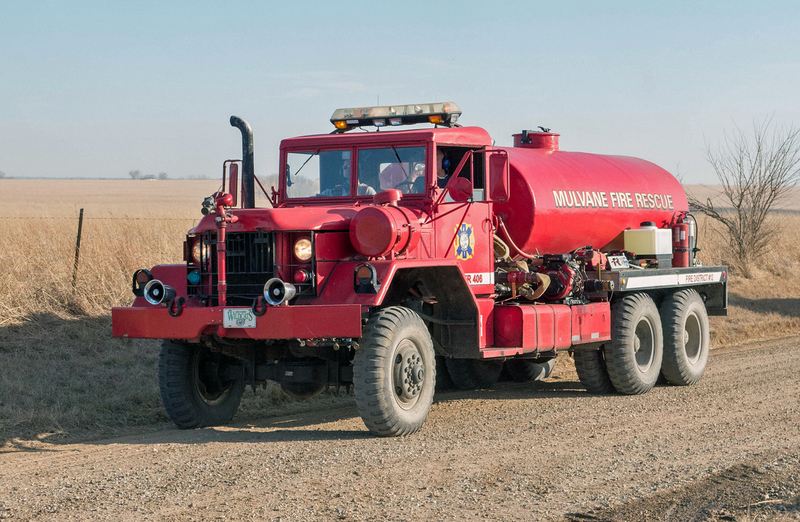 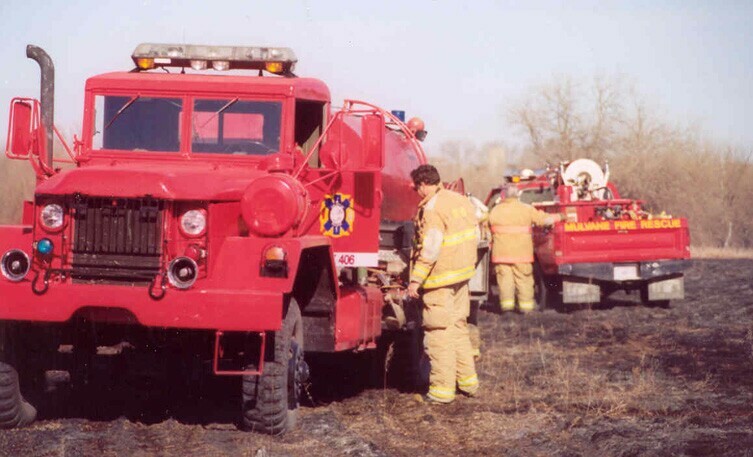 Low bid for this work was Emergency Fire Equipment in Mayfield, KS for a total cost of $5,000. 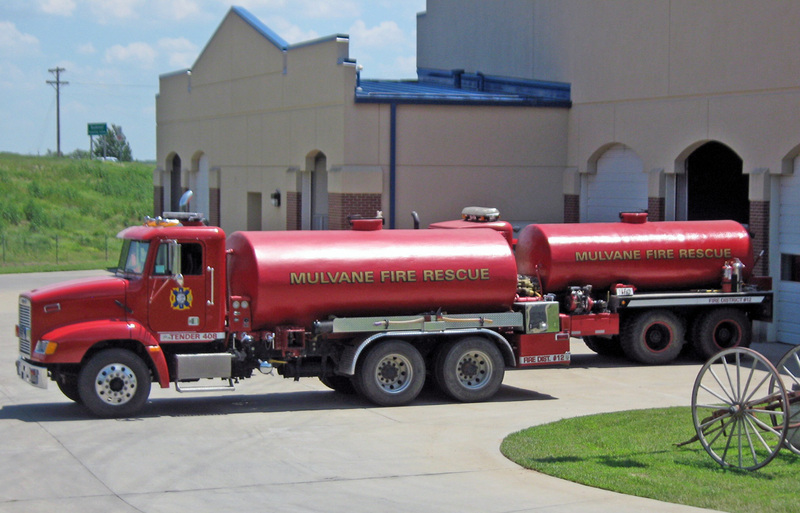 June 2010, Mulvane Fire Rescue is awarded a Volunteer Fire Assistance Grant from the Kansas State Forestry Service for $8,800. 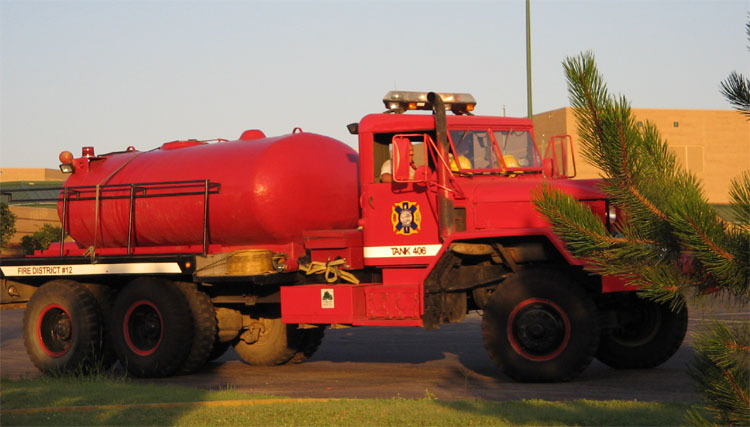 Forestry Service is providing 50% of this grant to replace the water tank on Tender 406. 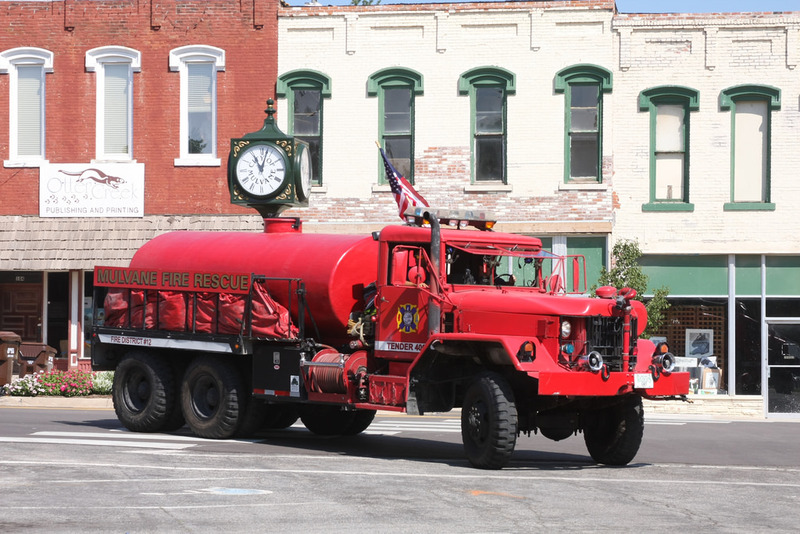 The tank will be upgraded from 1,600 to 2,000 gallons of water, a 10 Newton dump will replace the old 8" round dump and both a 2.5" & 4" direct tank fills will be added to the rear of the tank. 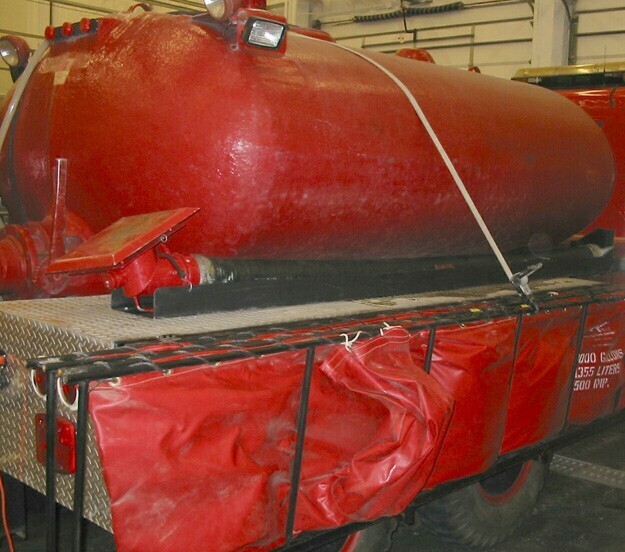 Upgrades to the pump, hose beds & storage compartments are also being made. 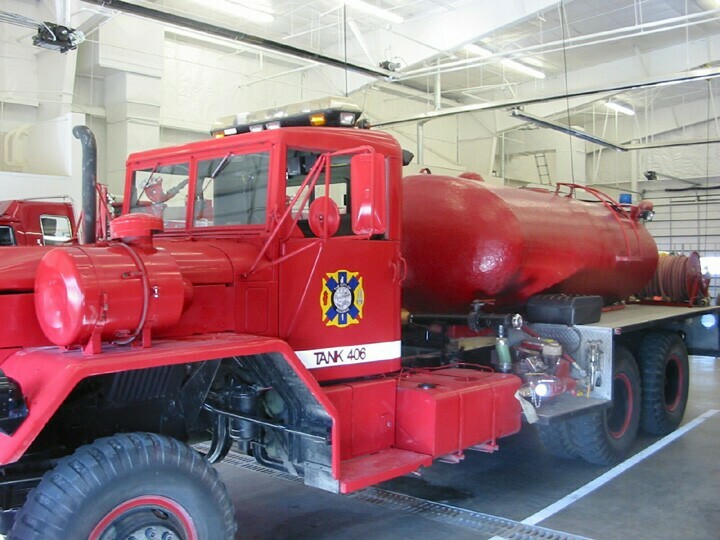 Fire District #12 is paying for the remainder of the $11,000 upgrades. 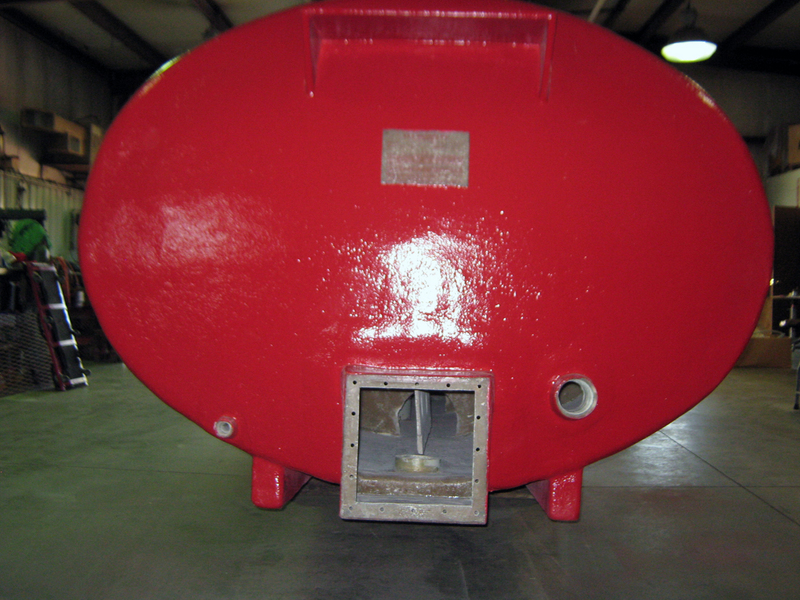 New 2,000 gallon tank, rear view, front view, internal baffling. 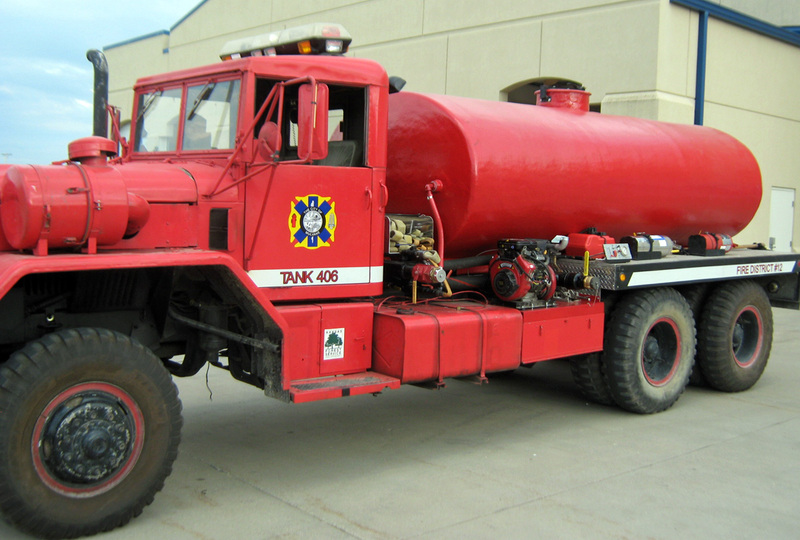 New tank mounted on truck. 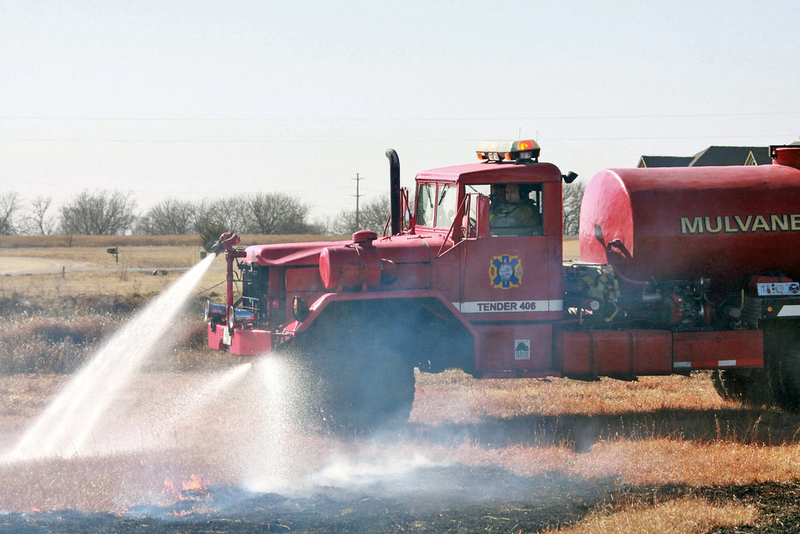 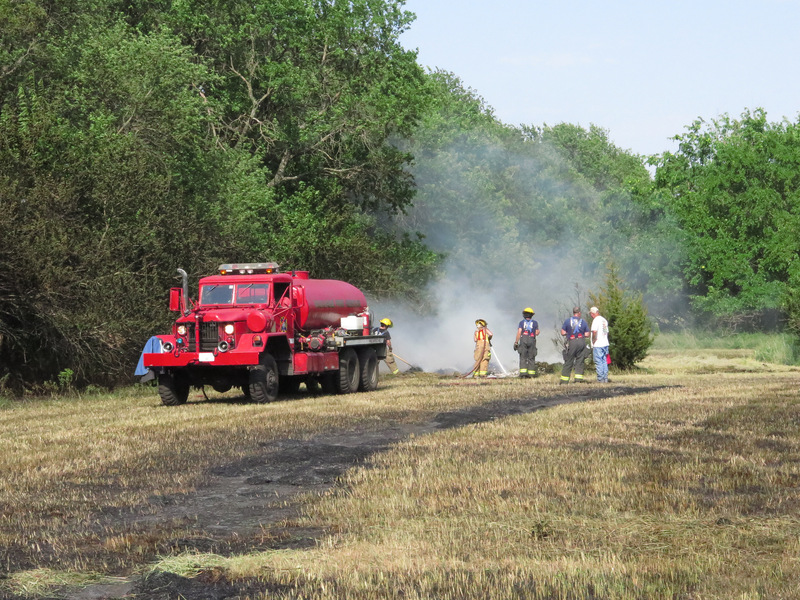 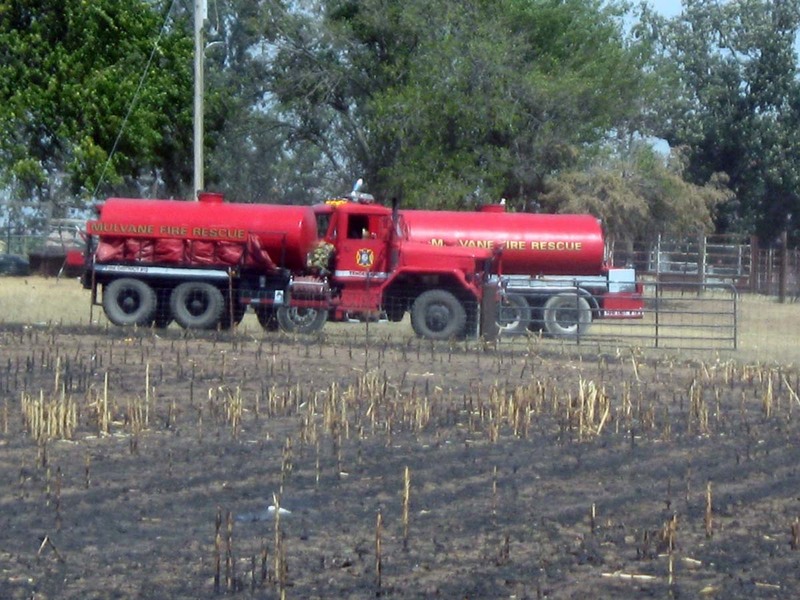 Emergency Fire Equipment in Mayfield, KS is performing the work. 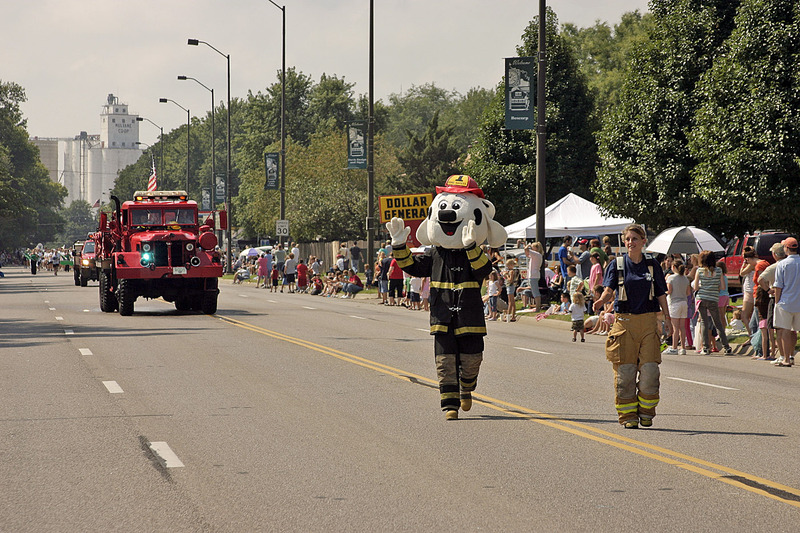 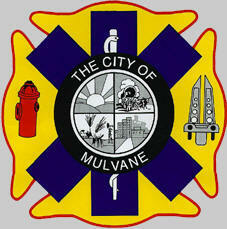 August 2007, Mulvane Fire Rescue is awarded a Volunteer Fire Assistance Grant from the Kansas State Forestry Service for $5,000. 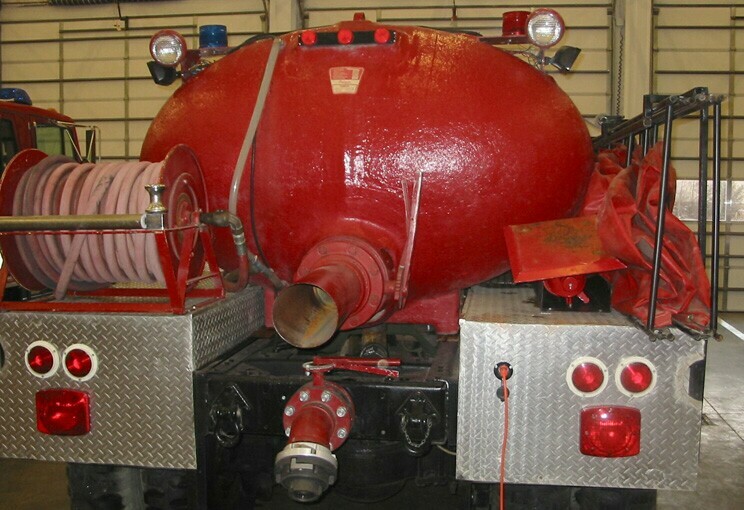 Elkhart Remote Control Sidewinder Monitor nozzle was added to help in the suppression of wildfires. 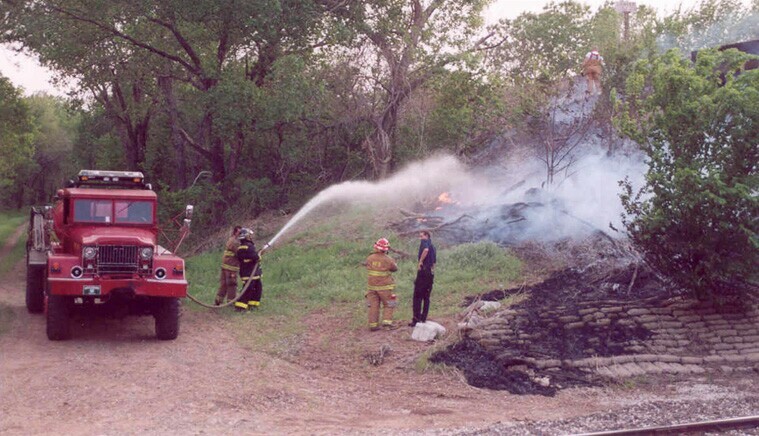 June 2005, Mulvane Fire Rescue is awarded a Volunteer Fire Assistance Grant from the Kansas State Forestry Service for $3,450. 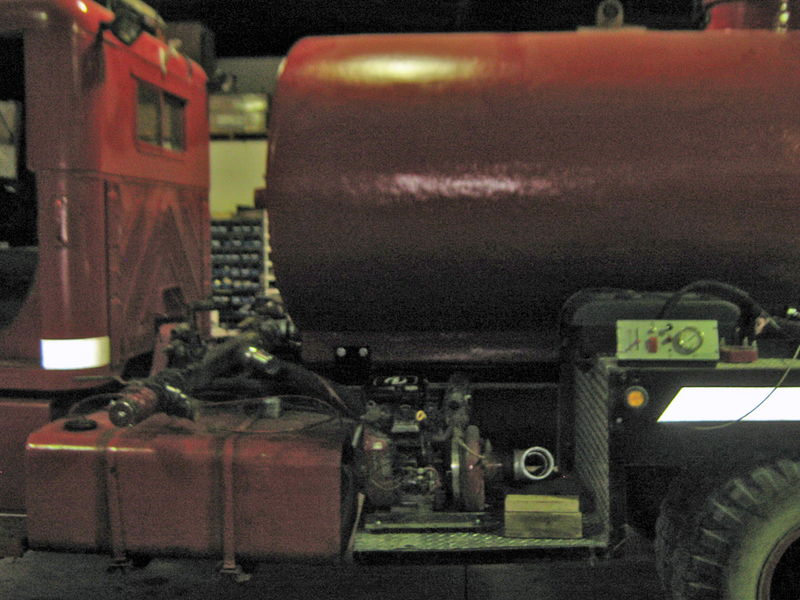 A new 400 GPM Hale HPX400-B18 pump was installed to replace old 300 gpm pump. 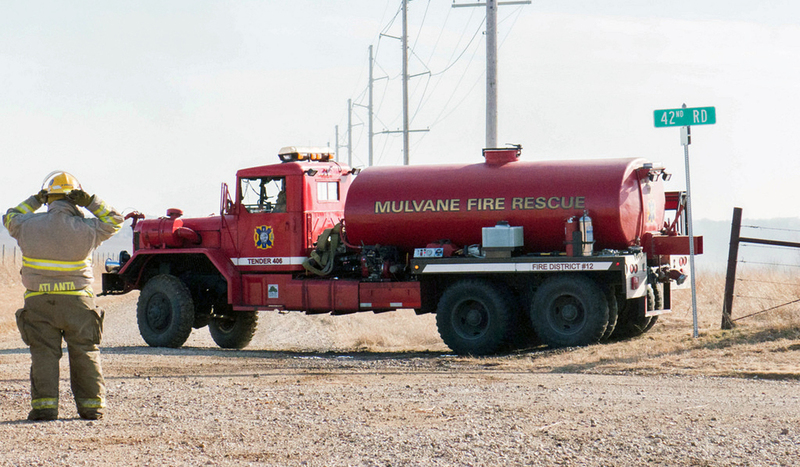 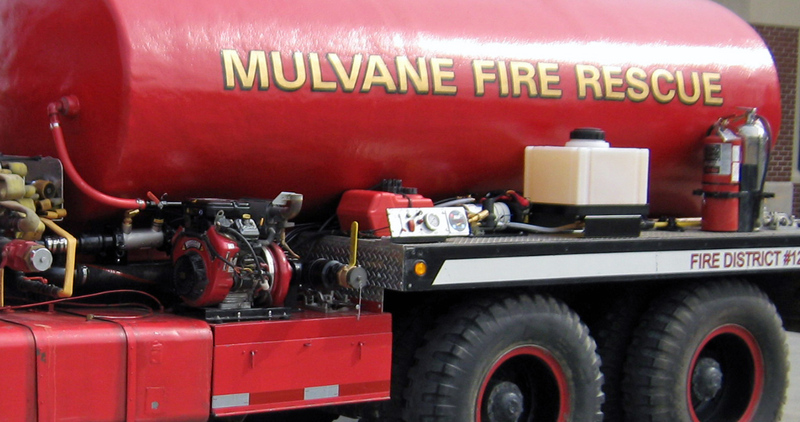 Mulvane Fire Rescue receives (new) 1971 5 Ton 6x6 to replace 1954 5 Ton, Tank 406. 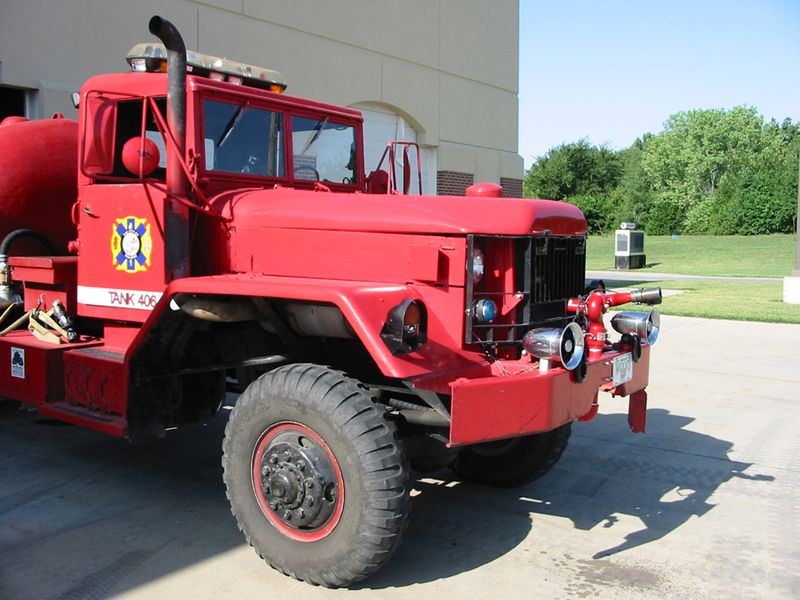 This 1971 6x6 is a 225 HP diesel truck, which replaced our 175 HP gas burner. 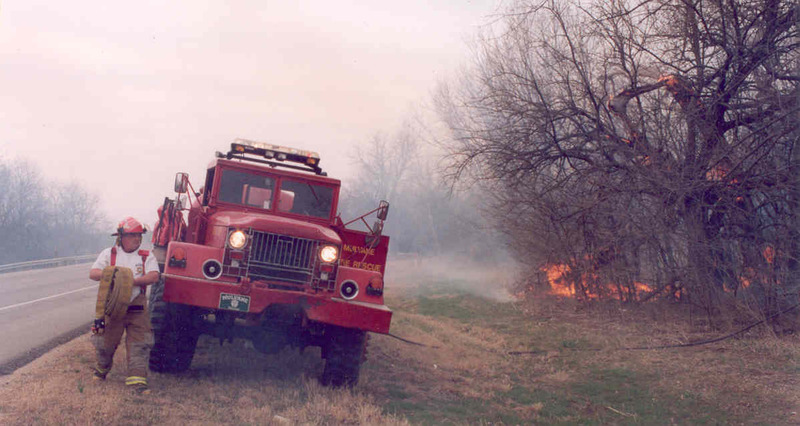 Both of these trucks are on loan from the Kansas Forestry Division. 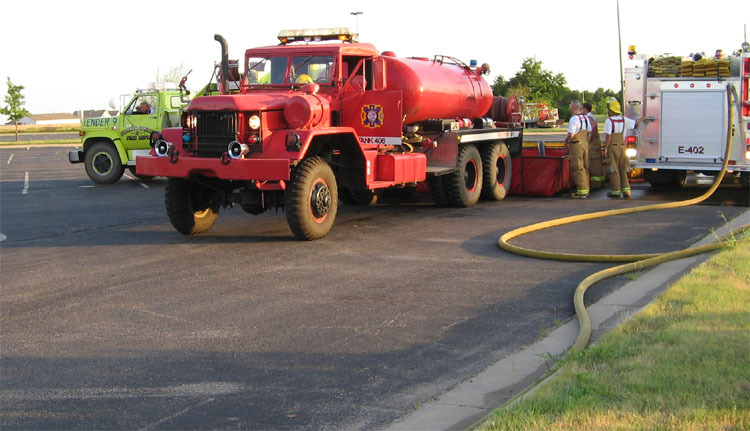 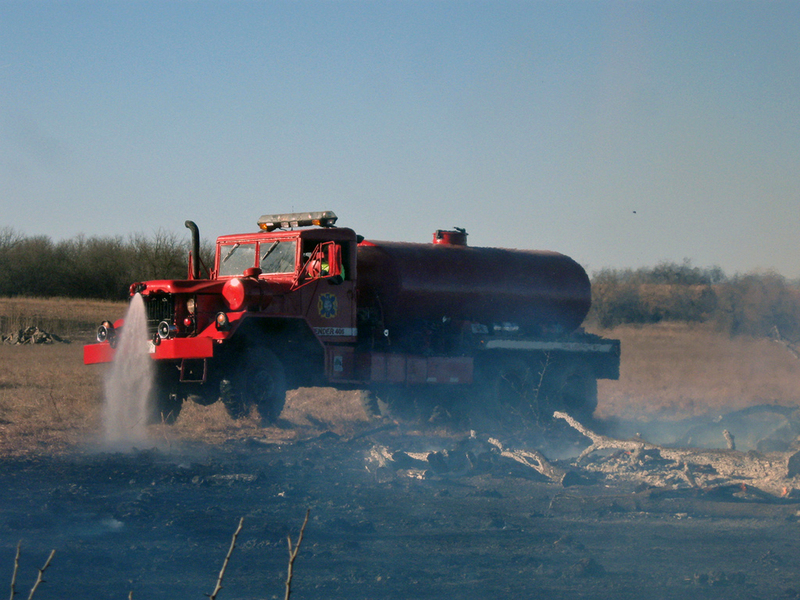 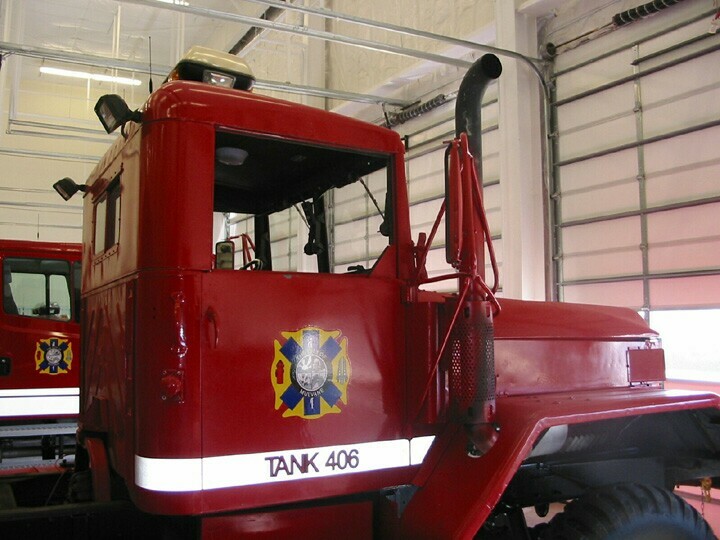 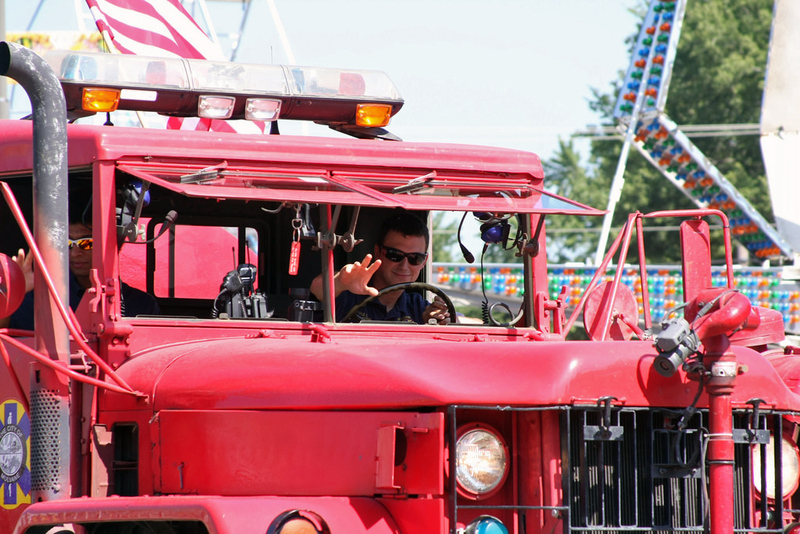 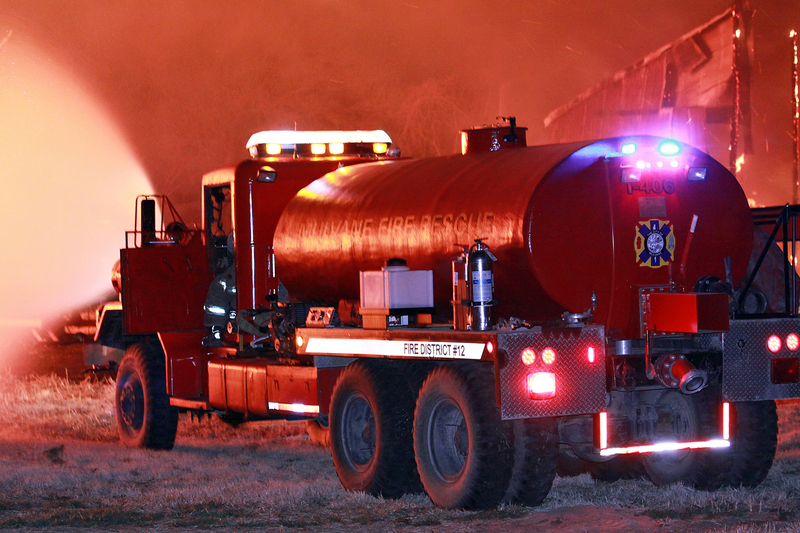 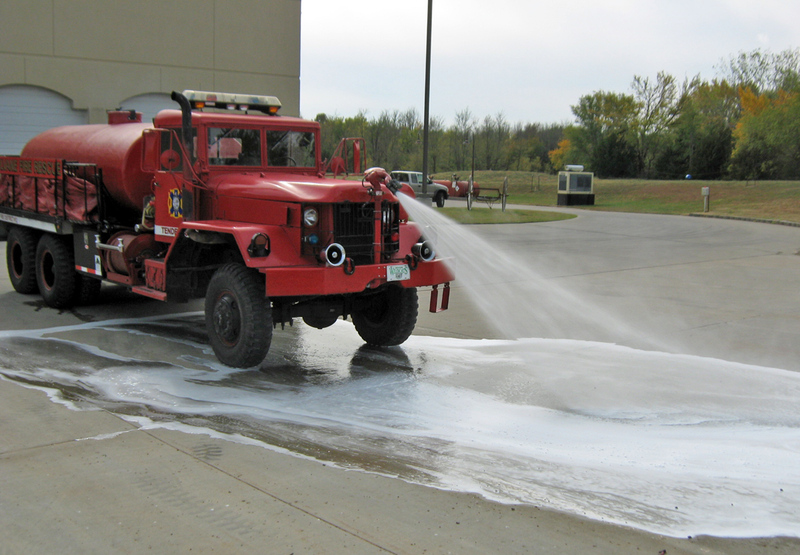 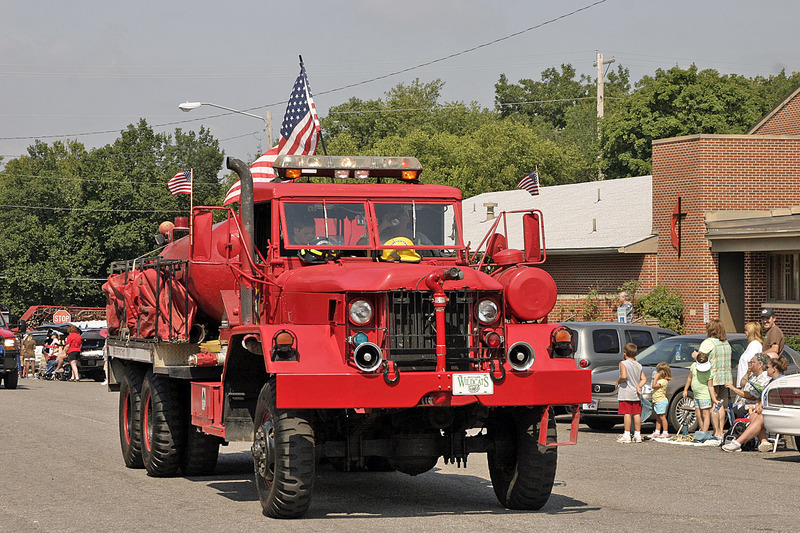 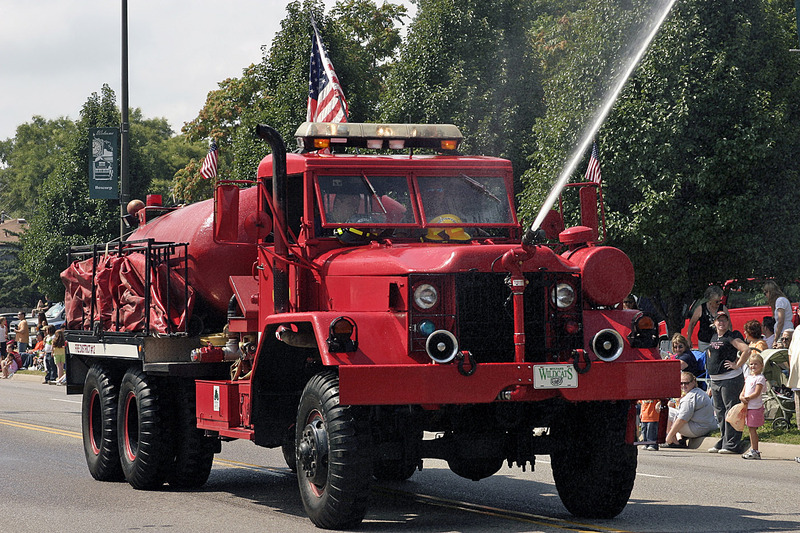 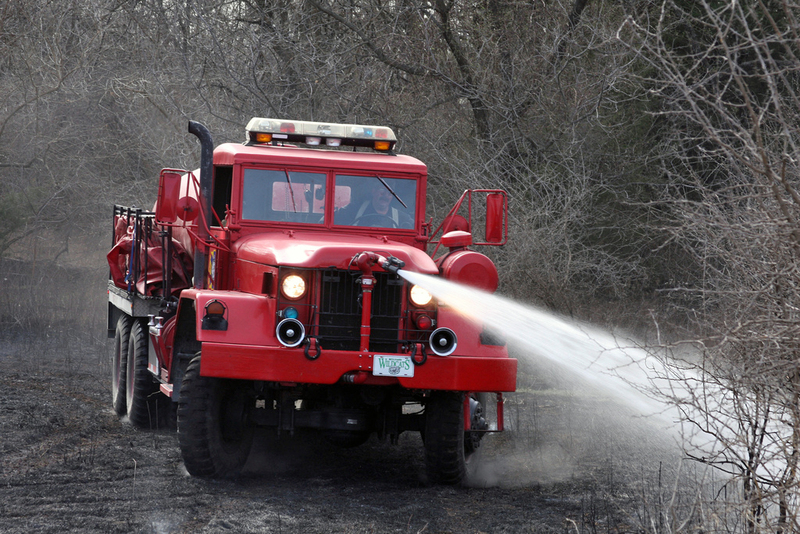 Tank 406 serves as both a water tender and a brush truck. 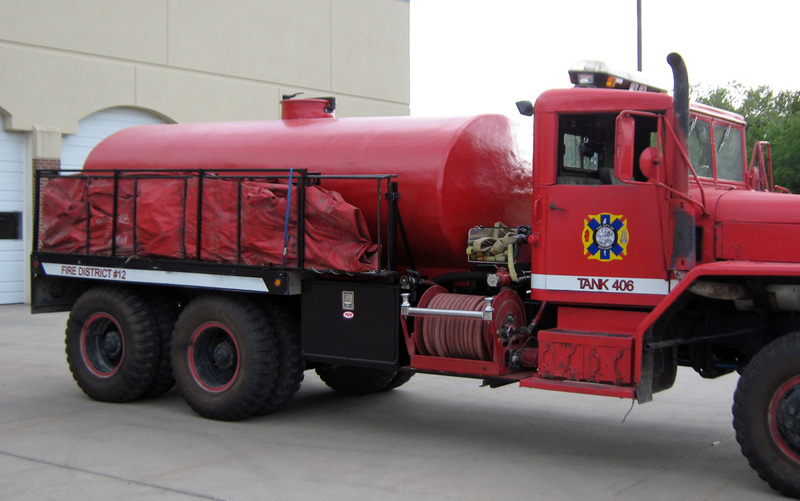 It carries 1,600 gallons of water with pump and roll capabilities, as well as a 5" quick fill and 8" dump valve. 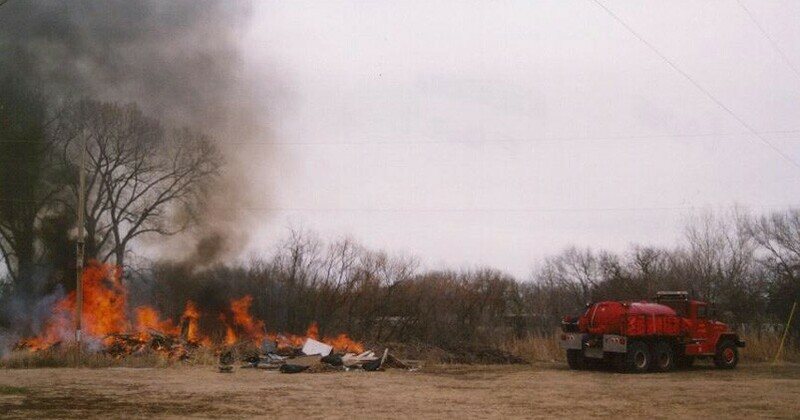 This is the unit we picked up from Kansas Forestry. 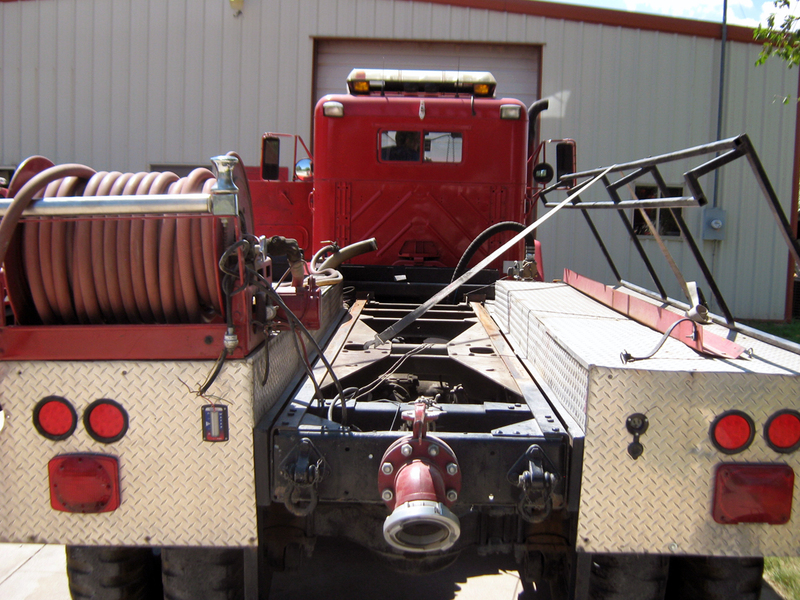 We cut the frame down to the same length as our 1954 5 ton truck. 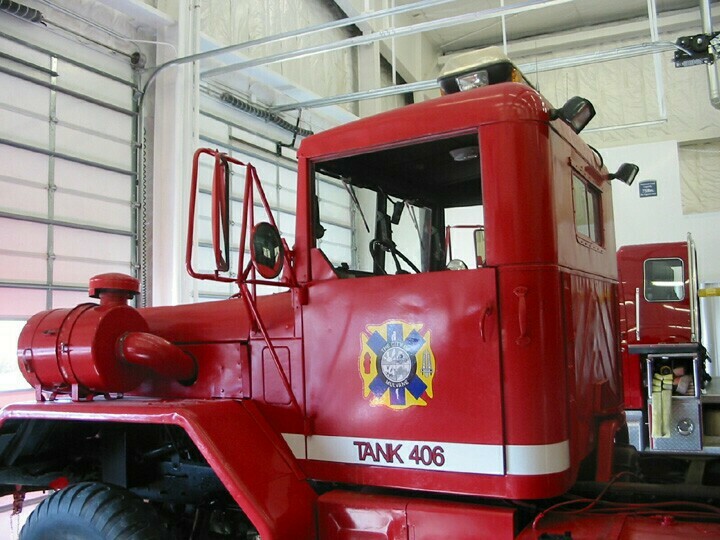 Painted the Cab and Chassis the next weekend. 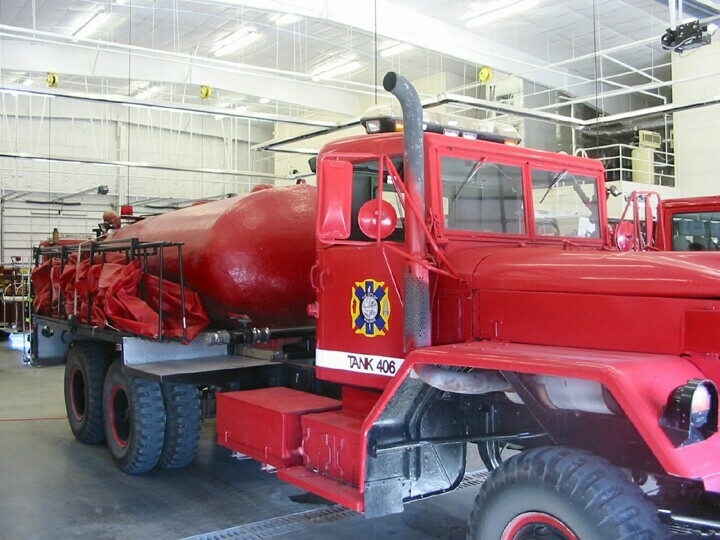 We then began the process of transferring the equipment from the 1954 truck to the 1971 model. 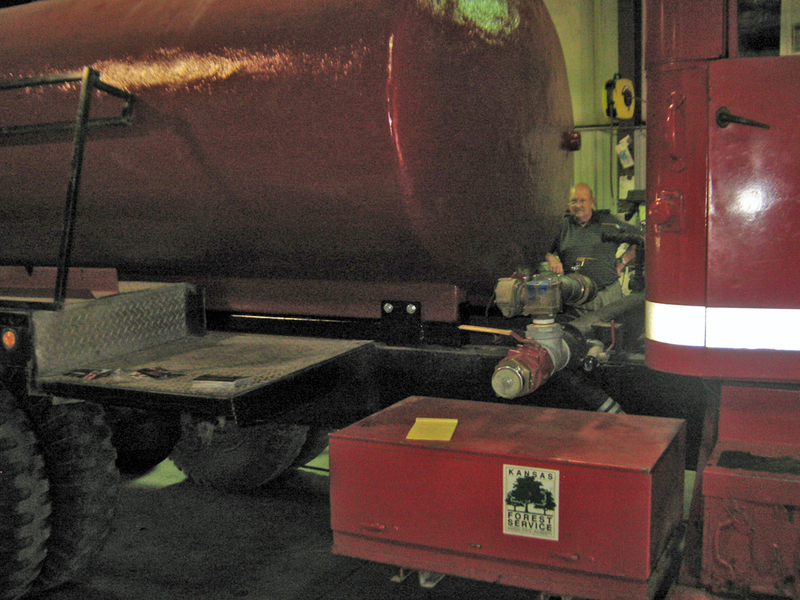 We ripped a 4x4 in half at an angle to place between the tank and the truck frame. 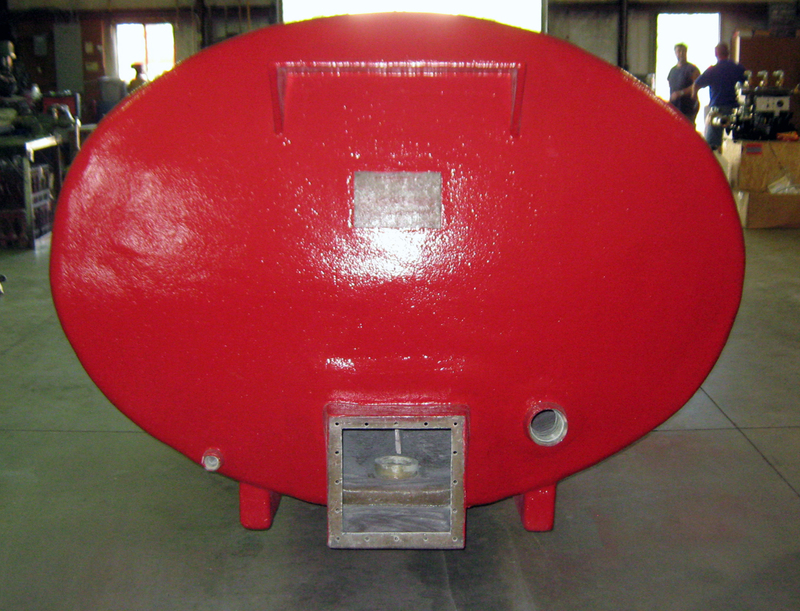 This created a 4" lift at the front of the tank to help in the Dump Valve offloading process. 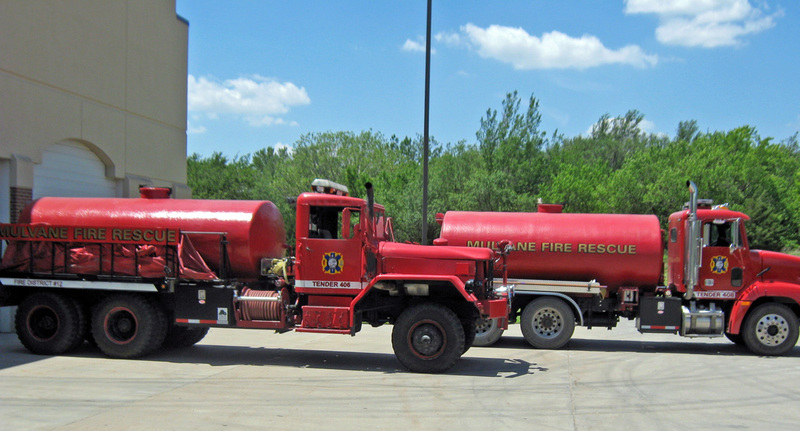 We re-used the tank, fenders and pump from the old truck. 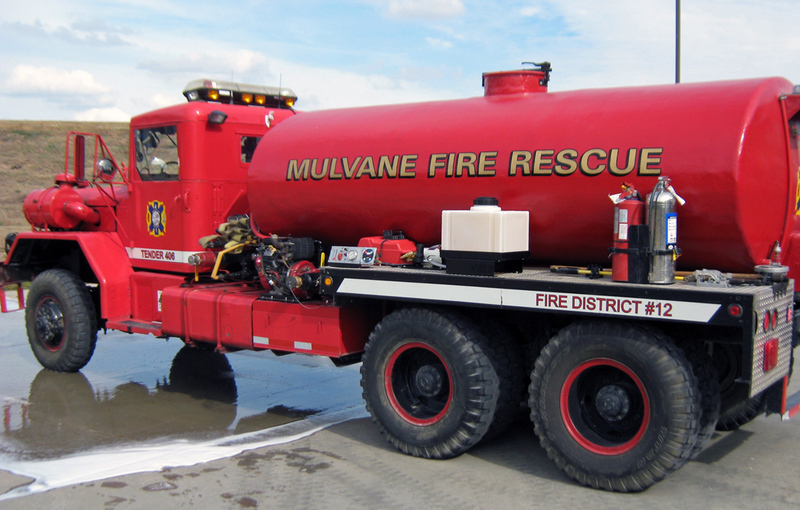 Within 3 weeks we had this truck operational. 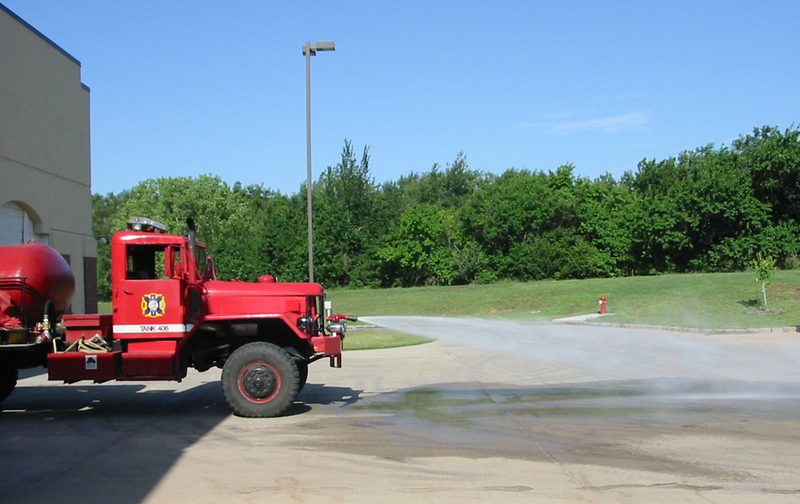 We reused the old Hale 300 GPM pump. 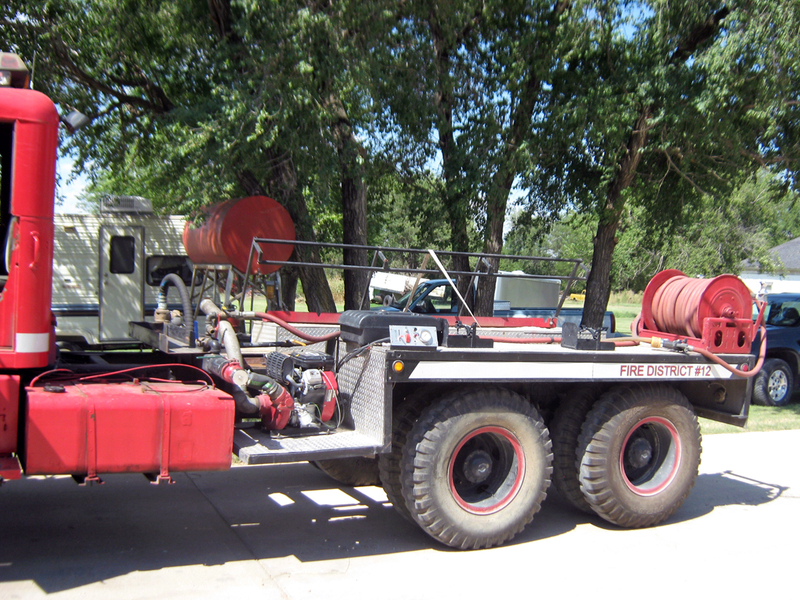 The truck is plumbed for one 2 1/2" discharge or (with a gated Y valve) two 1 1/2" discharges , one 1" forestry line, one 1" booster line, and a 1" tank recirculation line. 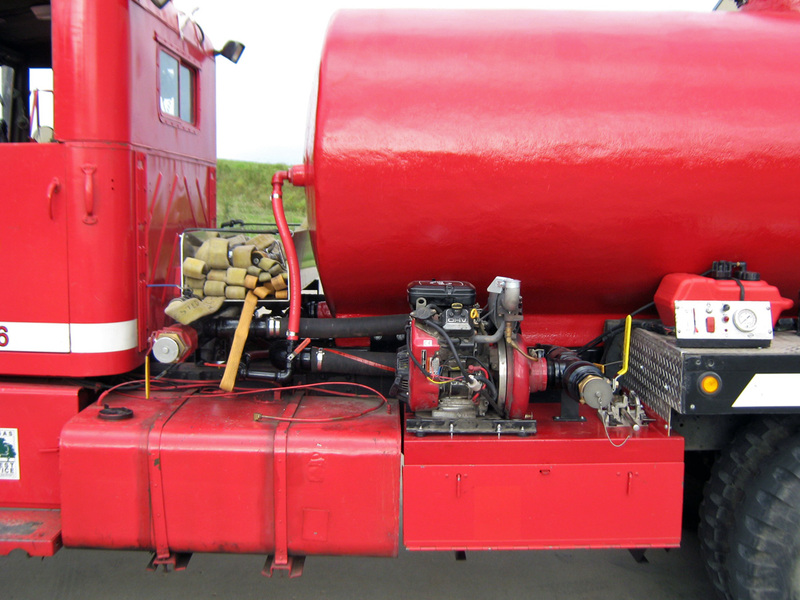 Dual Dump valves speed up the offloading. 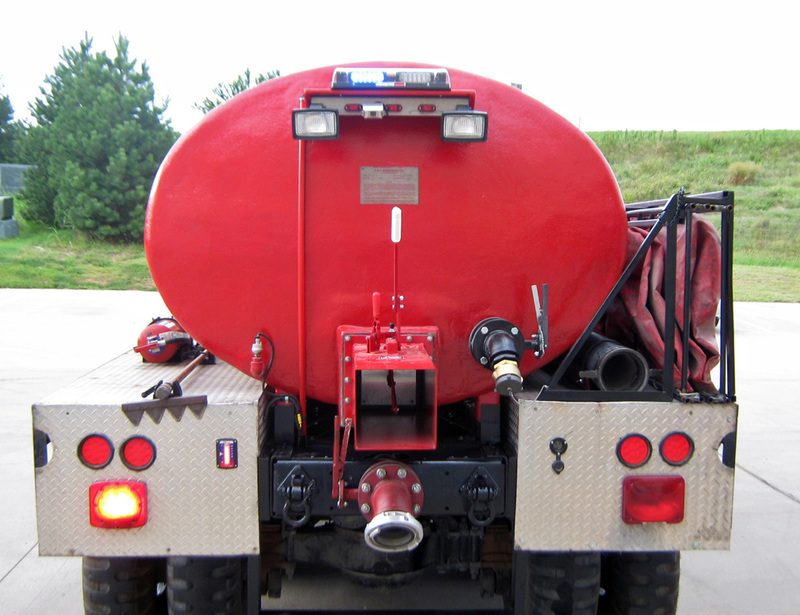 The bottom valve is on a 4" line which can be used for either dumping or filling. 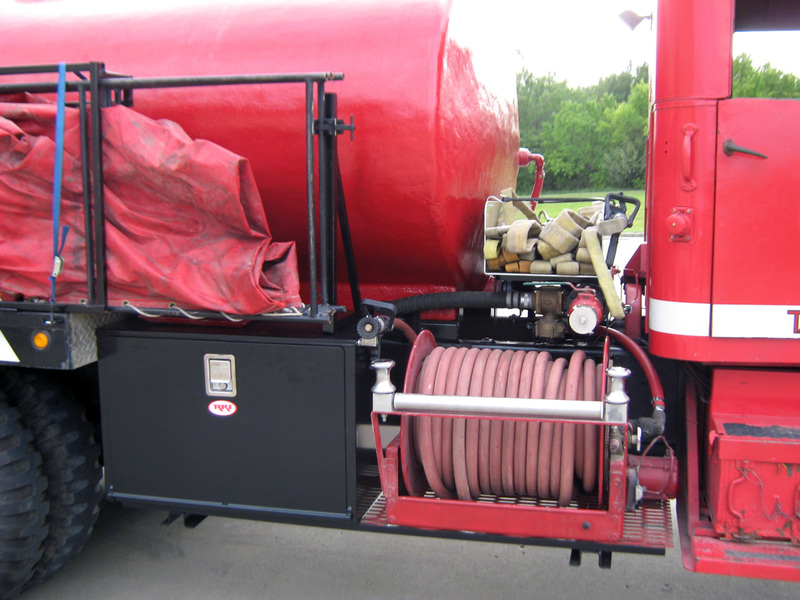 It has a 5" Storz fitting with a 2 1/2" adaptor so you may fill with either size hose. 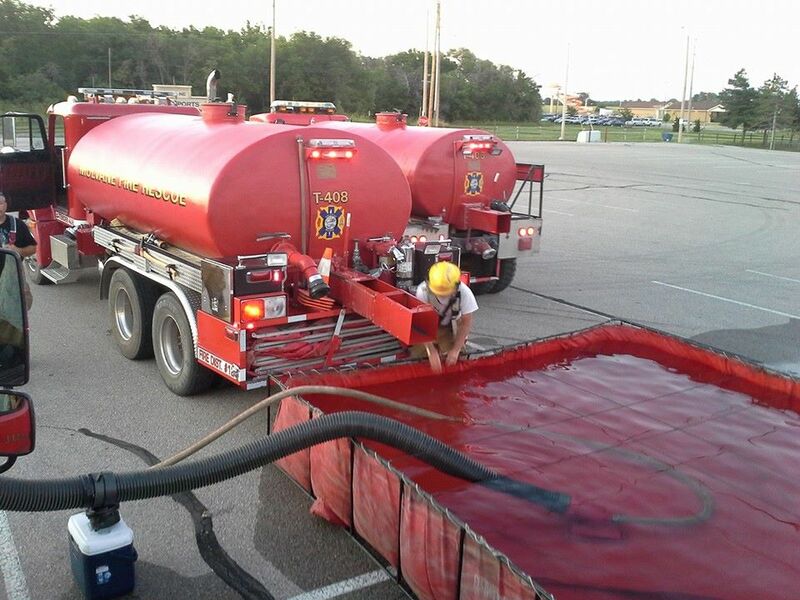 The truck carries a new 3,000 gallon dump tank to match the dump tank on our other tanker, Tank 412. 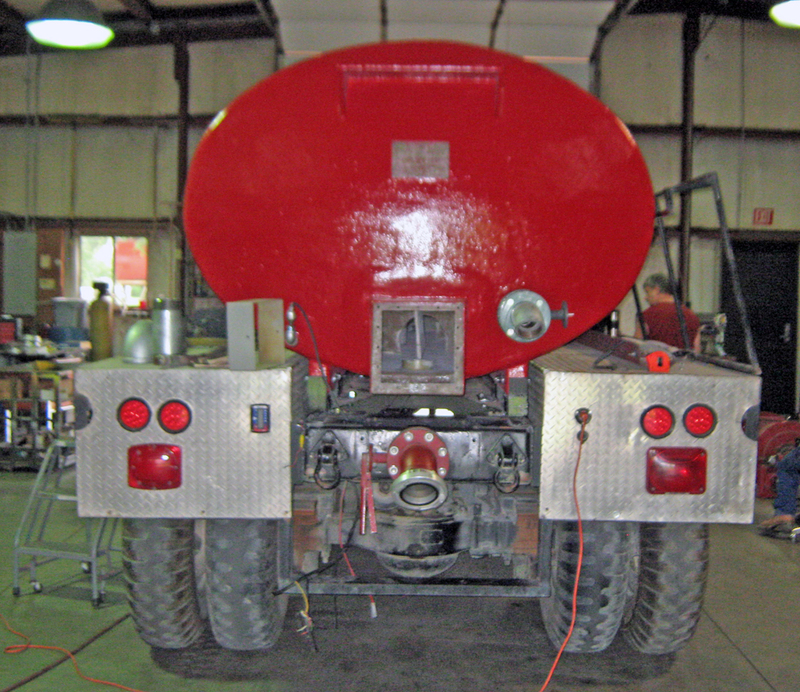 The electrical system was completely reworked to provide both 12 volt and 24 volt. 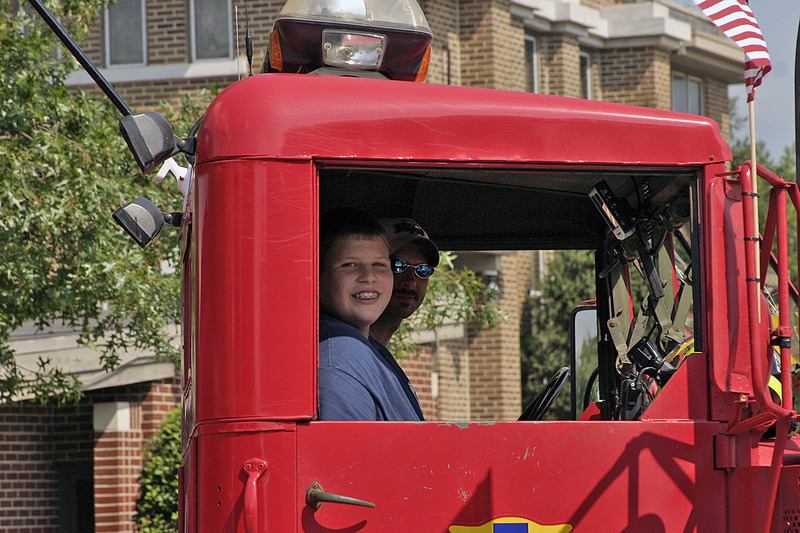 All the electrical control circuits were placed behind the passenger seat. 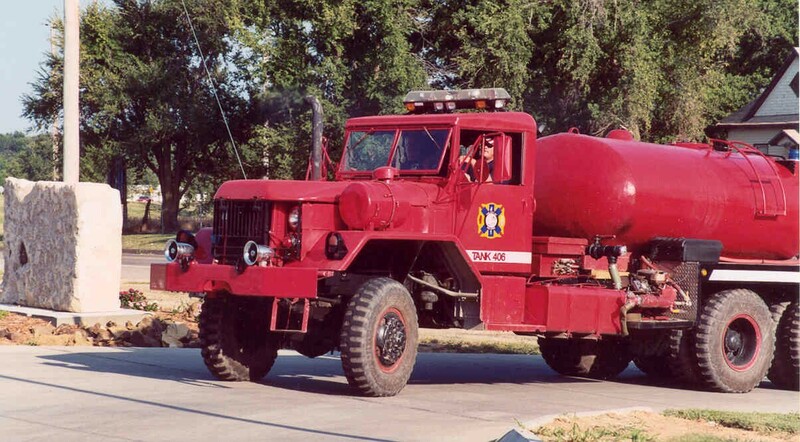 Anything that could be converted to 24 volts was done so and controlled by 12 volt relays. 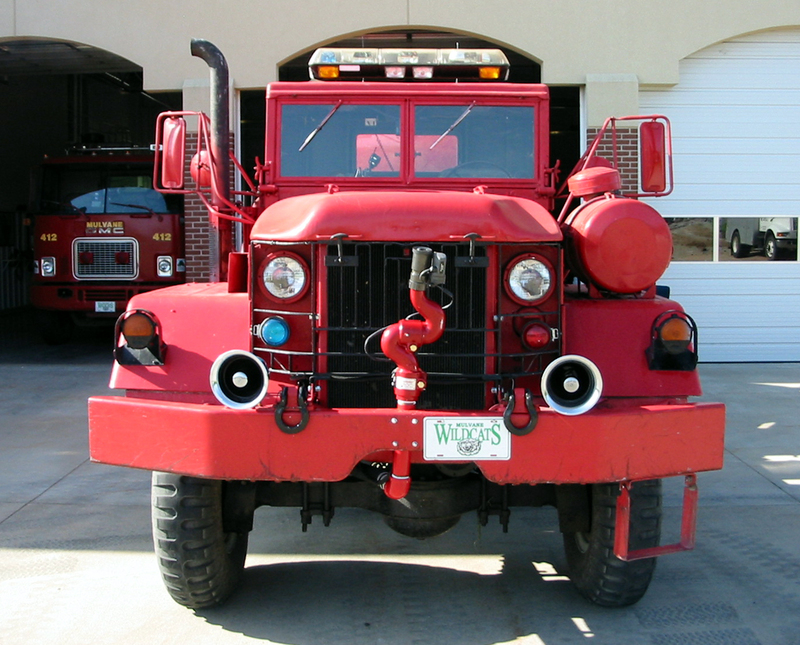 This included flood lights, strobe lights, and clearance lights. 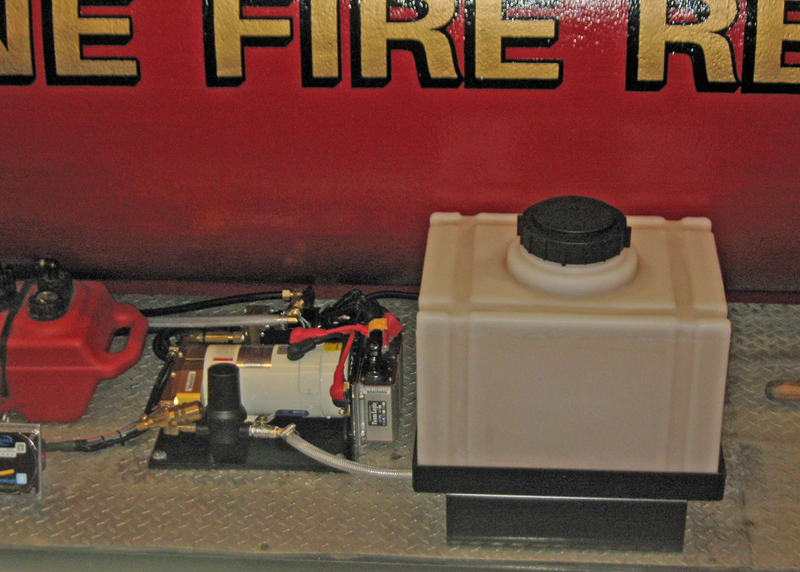 A Charge-Pro 10 amp automatic battery charger was added to keep both 12 volt and 24 volt batteries fully charged. 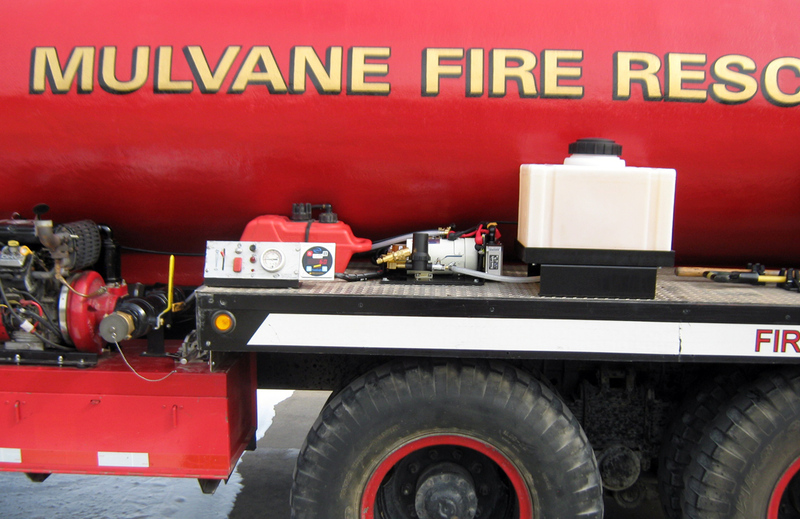 We added a Havis Shield Console and switching controls, trying to standardize our trucks emergency equipment controls. 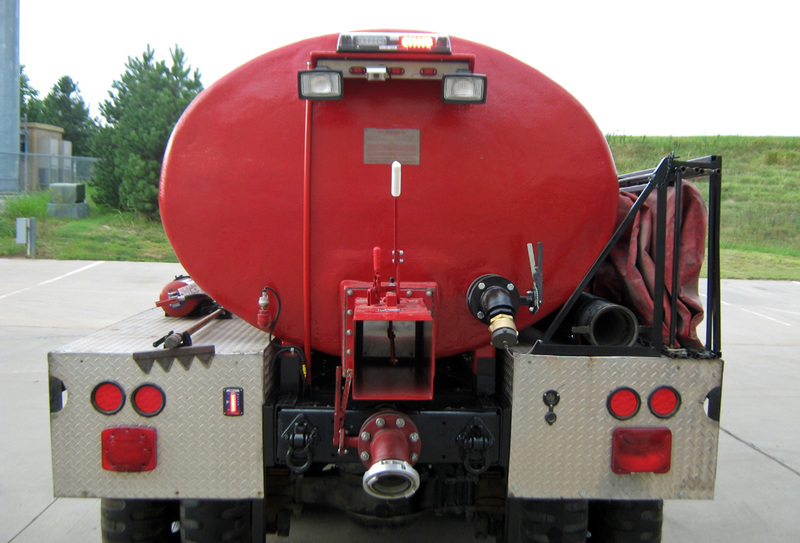 Installed reflective striping & truck numbering. 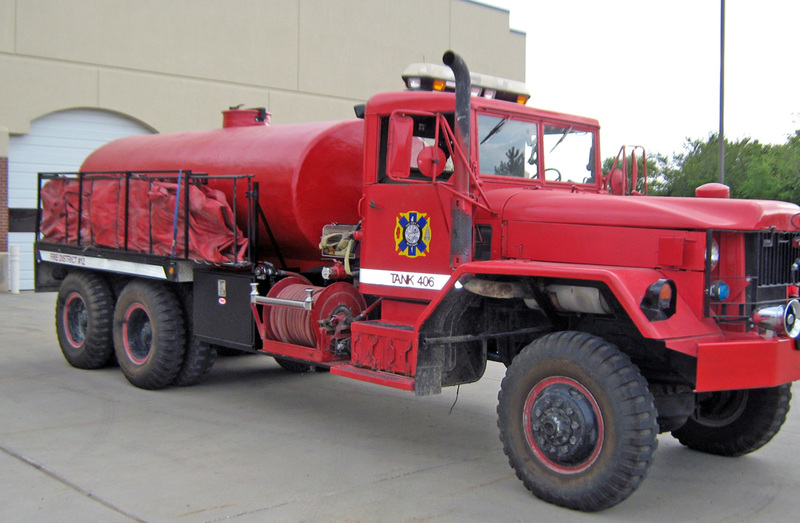 Narrowed up the fenders by 7" on each side, the 1954 6x6 was a bridge truck and had much wider tires. 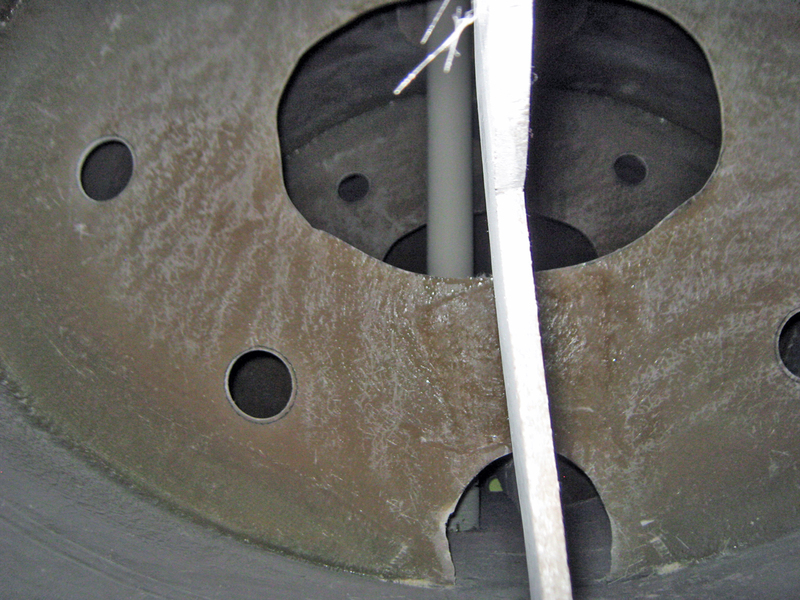 We also installed a bracket to carry a 10' piece of 4 1/2 hard suction hose. 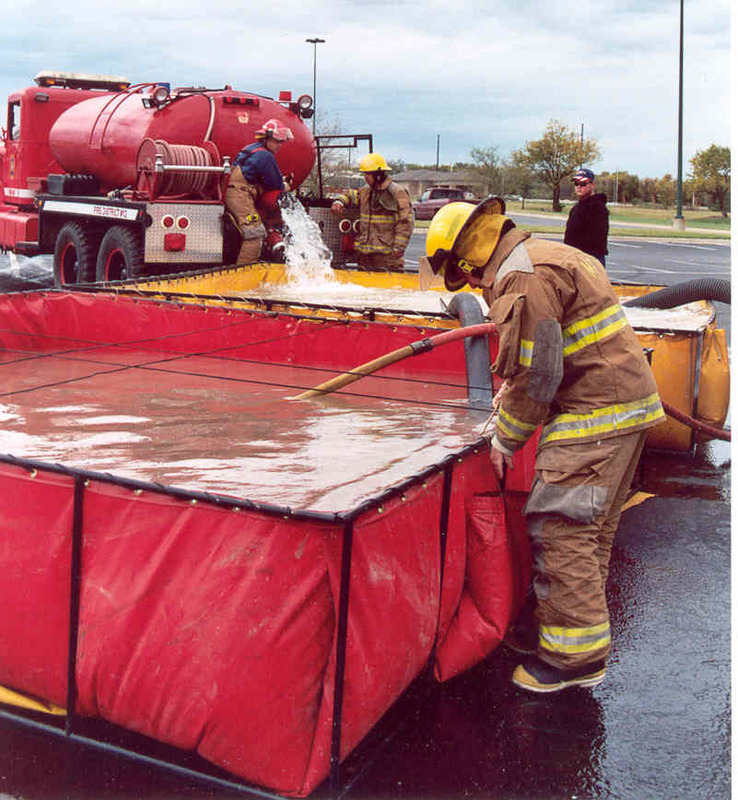 We have a low-flow Jet Strainer pre-attached to the hard suction hose. 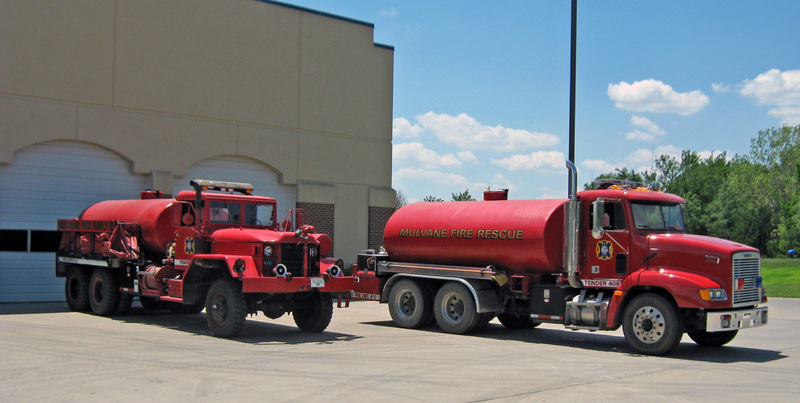 Since this is our second out tanker, this hose setup can be rapidly deployed so we may use dual dump tanks. 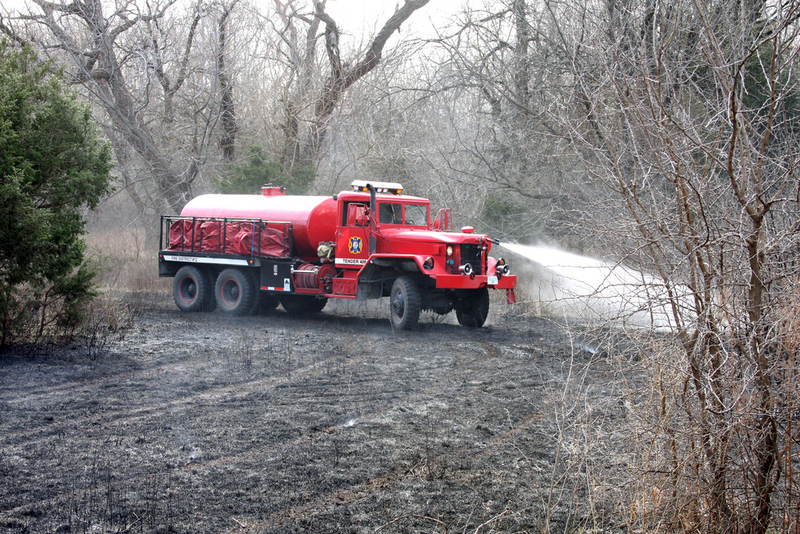 Old Tank 406 in action. 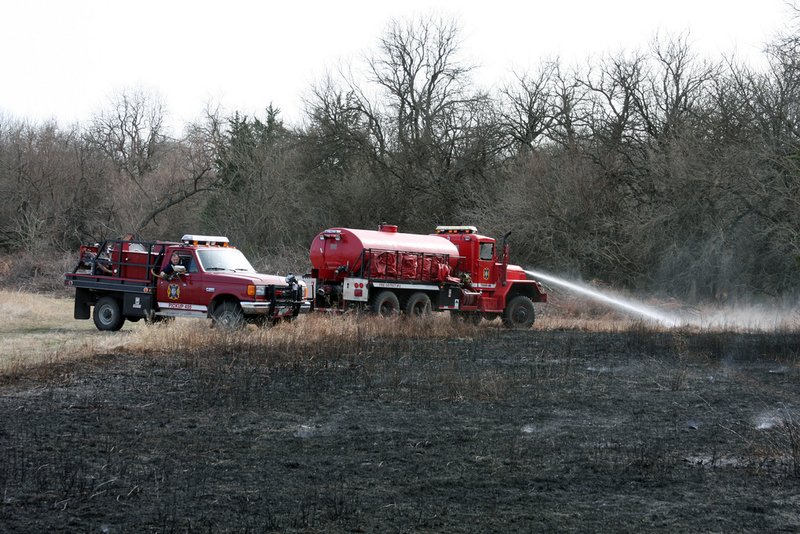 New Tank 406 in action! 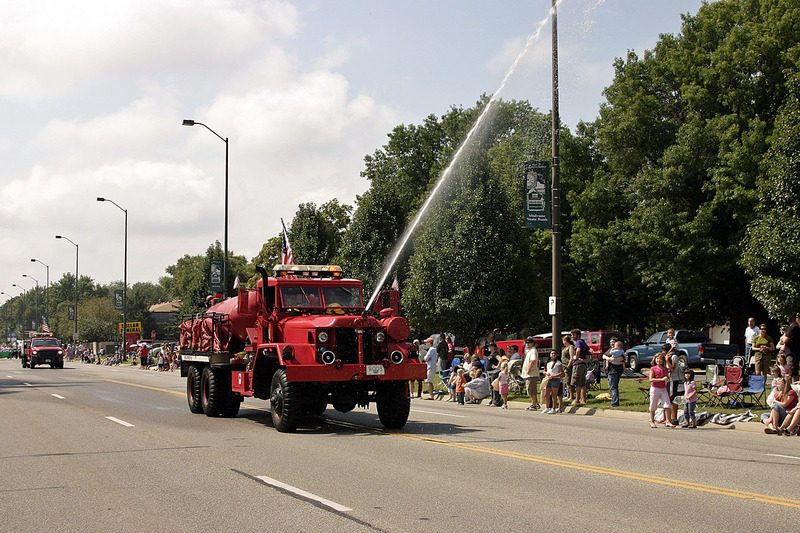 In 2005 the pump was replaced with a new Hale 400 gpm pump with a grant from the Forestry Department. 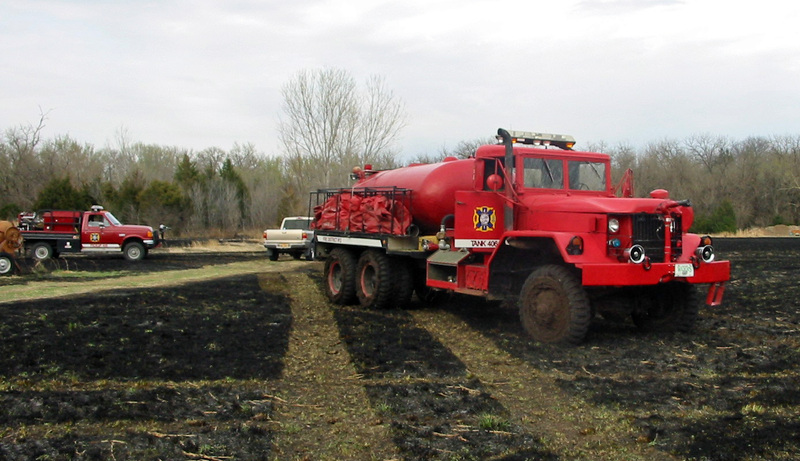 In 2007 a remote control monitor nozzle was added with a grant from the Forestry Department. 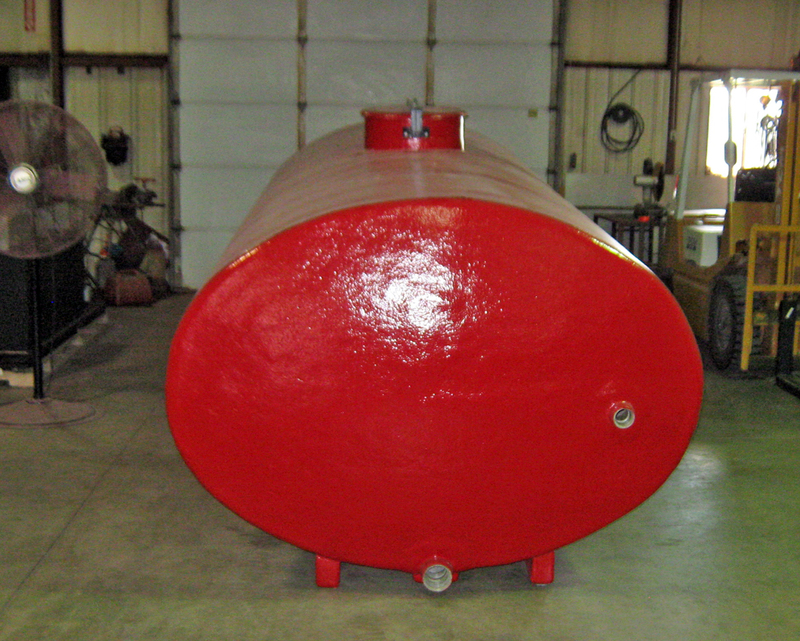 In 2010 a new 2,000 gallon tank was added with a grant from the Forestry Department. 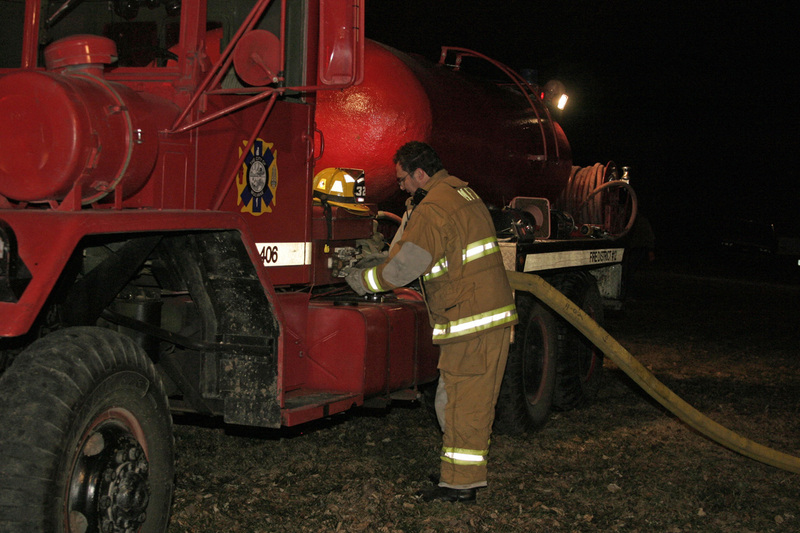 * Photo's by Aaron Mattson.